Early McDonaldland was a freaky place. Originally a transparent rip-off of Sid and Marty Kroft's H.R. Pufnstuf program, the mythical McDonald's realm was filled with anthropomorphized fast food products, volcanoes spewing milkshakes, and a recurring cast of villains attempting to steal food products from Mayor McCheese and Ronald McDonald, including the legendary Hamburgler. One of the more disturbing trends in early McDonaldland commercials was the prevalance of casual cannibalism. Mayor McCheese, himself a anthropomorphic hamburger, would occasionally indulge in a hamburger grown from the hamburger patch, each of which were themselves also anthropomorphized. The Gobblins, later renamed the fry guys, were brightly-colored bundles of McDonald's french frys, who roamed McDonaldland stealing and eating their smaller fry brethren. But little can compare to the freakiness of the original incarnation of Grimace. 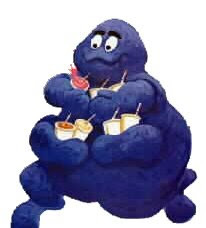 Originally named "Evil Grimace," the giant purple monster had four arms, and stole milkshakes from the various denizens of McDonaldland. 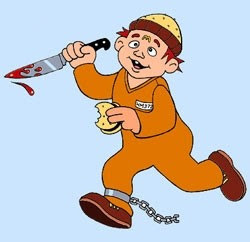 Bowing to outcry from consumers and parents groups, the McDonald's Corporation announced Monday that it is discontinuing its new advertising mascot, "The Hammurderer," a mischievous, homicidal imp who kills McDonaldland characters and takes their sandwiches. My name is Sir Shakes-A-Lot. I love a great shake. And he was drawn with little shake lines. I never felt any real affection for the character, mostly just a bit of pity that the palsy had gotten so bad, and if he wants to stop shaking he should stop drinking shakes. If only it were that easy. Fun fact: Sir Shakes-A-Lot was played by Rush Limbaugh. You know what were really freaky? The giant plastic jails in the old McDonald's Playland. What's up with those?